There are many different, easy versions of chicken and rice, from the one-pot Campbell's Soup recipe, to box mixes and the like. But most don't really taste that great, which is why the recipe I found on a bag of jasmine rice really stood out to me. 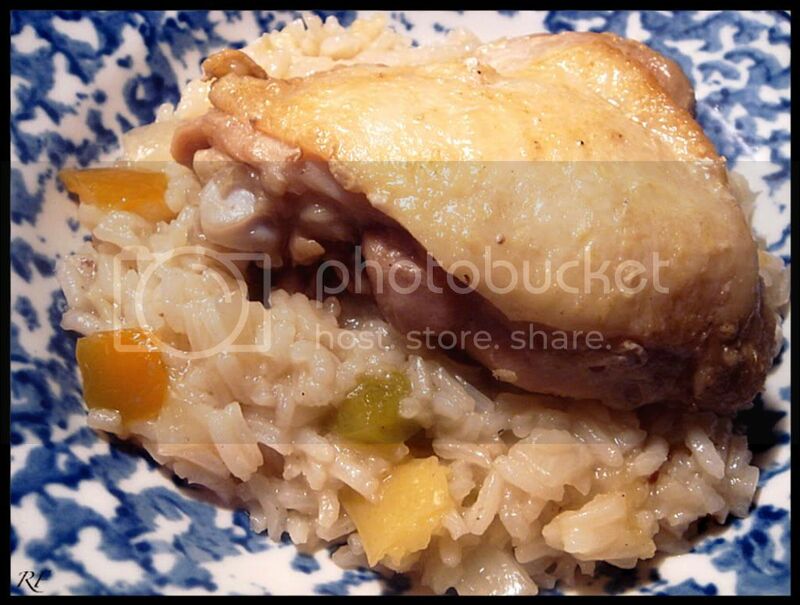 The chicken and rice mixture is infused with jasmine tea, and the resulting taste is subtle, yet nice when combined with the chicken. I usually add garlic and portobello mushrooms, but this time I added apples and green peppers. The apples were a great contrast to the rice and added a pop of tart-sweetness. Some of the apples really cooked down and blended in nicely. Because those two ingredients increased the water amount, the rice texture ended up being risotto-like instead of a bit sticky, but mainly separate. If you want a drier consistency, decrease the water to 1¼ cup. Add tea bag to 1½ cups hot water; let stand 2 minutes. Remove and discard tea bag. Ad bouillon to tea to dissolve. Heat large frying pan over medium-high heat. Add butter to melt. Add chicken, in single layer. Cook for 3-4 minutes on each side, or until browned; remove from pan. Add onion, garlic, apples, and green pepper to same pan and sauté for 1 minute. Mix in rice, pepper, and tea mixture. Arrange chicken, in single layer, on top. Bring to a boil. Reduce heat to low, cover, and simmer for 25 minutes, or until liquid is absorbed. Remove from heat. Let stand covered for 10 minutes before serving. I like the tea twist! Im going to try that. Plus apples always wrk and compliment a dish. You can't beat chicken and rice. It's very comforting. I would never have thought of adding tea to the water, what a good idea! Glamah - Apples in curry is another favorite combination of mine. Emiline - Do you know of those 'Chicken Soup and Rice' books? Those are my favorite! It makes me crave chicken soup and rice, or any chicken and rice combination. Sam - I never thought of it before, either, but it tastes amazing! Adam - It definitely will be. It goes on my menu rotation during the colder months.